2000 years ago, the Himalayan mountains revealed one of their deepest and oldest secrets: a 250 million year old natural salt crystal deposit. 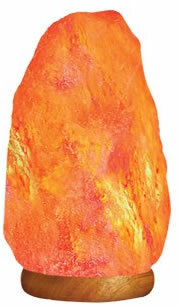 The pink salt crystal is hand-chipped from the mine and shaped by local artisans into unique lamps. These are then mounted on a Neem wooden base. The benefits of salt therapy are well known in Europe where there are many salt spas. Some have been in operation since the mid 1800's. This traditional therapy is now being introduced in the United States and other parts of the world. Its positive effects on health are felt and endorsed by thousands. Speleotherapy is a therapy that is unique to caves and mines for treating respiratory illnesses. It originated in Poland in the 1950's when it was noticed that salt miners rarely suffered from tuberculosis. It is a common treatment in Eastern and Central Europe, but almost unknown in other parts of the world. The most well known hub for speleotherapy treatment is in the Ukrainian Allergologic Hospital in Solotvyno. The hospital is located nearly 1,000 feet below the earth's surface in a former salt mine. Its staff reports a 90% effectiveness rating in reducing asthma symptoms for up to three years. There is no salt in the world that compares to Himalayan salt in purity and beauty!